Get my #1 trick for making a perfect stock as well as 10 tips for how to improve your stock to get better flavor, texture, color, or visual appeal. We made it to the final day, friends! By now, you’re proficient at all the basics of stock-making (plus, a few intermediate techniques) and you’re certainly ready to up your game, right? That’s what today is for; we’re going to be talking about how to master the intermediate techniques and improve your expertise up to “#CallMeMichelin” mastery level with these tips for how to improve your stock. Are you ready to make your stock even better? 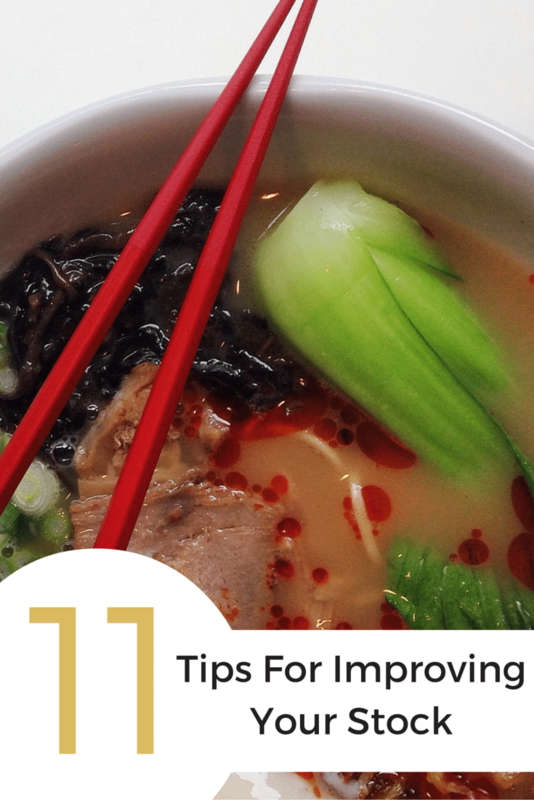 Use these 10 tips to improve your stock and give it better flavor, texture, color, or visual appeal. Also, there is a tip at the end for making sure it isn’t going to make anyone sick. . . that’s an important one. Double stocks can become expensive quickly, so I usually only make them if my first batch of stock turned out very poorly, or if I plan to serve a meal where an extremely flavorful and rich stock is the focus. A double stock is when you use a previously made stock in lieu of water when making a second stock. In turn, you can then use a double stock to make a third stock, called a triple stock. This helps concentrate the flavor, giving it a lot of complexity, but it can become quite expensive – especially if you are using meat as well as bones. If you really want to improve your stock and boost its flavor, try adding in some (unexpected) cuts – like pork rind or veal foot – which will contribute excellent flavor and are high in gelatin, giving your stock a rich, smooth texture. If those aren’t readily available, you may get lucky with cheap organs, like hearts, which can improve your flavor, but you don’t feel bad throwing away afterwards. If you do decide to go with organs, I recommend staying away from liver – it does have a distinct flavor that might be unappealing. . .unless of course you like liver. Did you know that if you add too many vegetables to your stock, or cook it too long, that the natural sugars in the stock can become concentrated, giving your stock a sweet flavor? I address this in my “one trick for making a perfect stock” tip below, but if you run into this problem you can either strain out the vegetables and thin out the stock a bit, or just alter your recipe for next time. Changing the recipe can be tough if you are a complete utilizer because your ingredients are based on what you are cooking that week, but it can be done. I know I briefly mentioned this in my explanation of how to make a white stock, but let me go further. You should always start with cold water because allowing the ingredients to rise in temperature with the water allows the proteins in the meat to coagulate in large chunks that can be skimmed off of the surface when they rise. If you use warm or hot water, they will coagulate too quickly and form into tiny particles that can’t be strained out and will make your stock cloudy. The same goes for adding liquid to the stock. If your stock is simmering, but has reduced too much and you want to add more liquid – make sure it is cold and add it slowly so you don’t churn any of the stuff on top back into the stock. This is an easy way to improve your stock! Boiling, instead of simmering, aggravates the stock causing the gross scum that rises to the top to be pushed back down into the stock. This breaks it apart, and ultimately emulsifies it so it can’t be strained out. This gives you a stock that is greasy, lackluster, and muddied. Nobody wants scum in their stock, am I right? Also, stirring your stock can cause the same problem, releasing the scum from the bottom and sides of the pot and recycling it back into your stock. Resist the urge! When it comes to skimming, you can have as little or as much involvement as you want, but the effort you put in will show in the end product. My recommendation is that for the first hour of stock-making, skim the top every 10 minutes, and then every 45 minutes after. I like to use a ladle so I can get as much scum in each stroke as possible to prevent pushing it back down into the stock. Don’t forget to rinse your ladle between uses (or store it in a container of cold water) so the scum doesn’t get caked onto it. I don’t know about you, but I have the tendency to do a “more is better” approach, filling my stock pot with water instead of sticking to the ratio of 50% bones, 10% mirepoix, 100% water. If you have too much liquid, your stock will be too light and bland. As a rule of thumb, keep it at around 3 cups – 1 quart of water to each pound of bones. You can always add in more water if you need to. On the opposite side, if you over-reduce your stock and have too little liquid it can lose some of the hints of aromatics that you’ve worked so hard to put in. You want your stock to have a syrupy texture, not be able to make a jello mold out of it. If you’re looking to get a really strong flavor, try a double or triple stock instead of over-reducing. Just like how you don’t want to aggravate the ingredients when you are cooking your stock, you also don’t want to move them more than necessary when straining. This can release small particles and unnecessary junk into your stock. Instead, give your stock plenty of time to strain on it’s own – don’t press down, or stir the ingredients in your sieve, just let them follow their natural course. Did you know that beef broth was once used to line petri dishes because it is a perfect breeding ground for bacteria? In both of my recipes you’ll notice that I mention to cool your stock in a food-safe way, such as a cold-water bath. This is because stocks that stay between 40°F and 140°F (the temperature of your home) are in danger of food-borne illness and spoilage. There is a bit of a catch-22 with this, because in the tip I just mentioned above I told you to the let the stock drain at it’s natural course…and that’s true, but don’t risk making yourself or others sick to make that happen. I’d rather lose a cup of stock than have everyone making a run to the bathroom after eating a meal I’ve served them. To properly cool your stock, I recommend turning your sink into a “shocker”. Just like with blanching & shocking, we are going to put our container of stock (make sure the container is sturdy) into a sink filled with ice water (more water than ice). Ideally, you want a container that floats so the cold water can cool it on all sides, but make sure that you have a lid that can ventilate to let the steam out. If you’re not able to use a floating container, you want to strike a balance and have a container that is able to sit on the bottom of the sink and have as much ice water as possible surrounding it without it carrying away your stock. If you have the time (and patience) at the very end of the stock-making process, when you go to throw out all of the leftover mirepoix – recover the bones. You can then rinse them off and throw them into a clean stockpot and simmer them again. “Why on earth would I do that”, you must be thinking. Because this is what is known as a remouillage (french for “rewetting) and it is a weak stock that can be used in place of water for making the next stock. It won’t have quite the oomph of a double stock – but it certainly will be better than using water. I know it seems like a pain, but this is a nice way to improve your stock if you make it often. If I could talk you into trying any one tip to improve your stock, this would be the one! When you make a vegetable stock, you usually only simmer the vegetables for 30-45 minutes to prevent overcooking the vegetables (which causes bitterness) and breaking them down so far that it becomes hard to strain. So why would we keep our mirepoix and other ingredients in our bone-based stocks for the entirety of the cooking time? That doesn’t make sense, right? Instead, if you want to make your stock the best possible, add in the aromatics for only the last hour of cooking! So simple, right?!?! “But what if I’m caramelizing the vegetables, Mackenzie?” Good question! If you plan to caramelize the vegetables for a deeper flavor and color, you can do that ahead, just like with the brown stock. Just roast them in the oven instead of in your stock pot. Make sure that when you add in your vegetables, that you skim your stock first and add them in slowly, one at a time, to prevent agitating the stock. You’ll be so glad you tried this! This one tip can do so much! It can improve your stock because it maintains the flavor of the aromatics, prevents a sweet stock, makes skimming much simpler (you don’t have to fight around the vegetables), allows you to keep a closer eye on the amount of liquid in your stock, and is great for building flavor for double or triple stocks! I’m so glad you joined us for this super in-depth series on how to make stock. If you missed any of the other parts, make sure to go check them out. Each part builds on the ones preceeding to it, so if you really want to improve your stock, make sure to read each one. Thank you for stopping by, I hope you enjoyed all of the tips & tricks for how to improve your stock! Do you have any favorite tips you’d like to share? I’d love to hear them! Tell me about them in the comments, or show me on social media – @foodabovegold. Don’t forget to tag it #CallMeMichelin! Wow that was a lot of tips, I got overwhelmed by how I didn’t know most of them. And the beef trivia about bacteria is ew lol. All I could hear in my head was you saying it with the Jimmy Fallon “Ew” sketch voice. haha! But yes, ew indeed! I’m glad there was lots of new information in there and I hope it helps make your next batch of stock even more remarkable than I’m sure it already is :). Such great tips and I’m going to pin this post to retrieve the next time i make a huge batch of stock. Thanks for sharing.